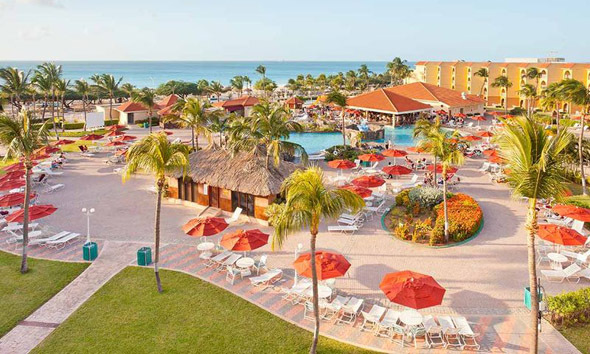 Interval International, a leading global provider of vacation services, presented La Cabana Beach Resort and Casino in Aruba with the Interval International Premier Resort® designation for 2016. The annual award recognizes resorts that provide outstanding vacation experiences with state-of-the-art conveniences and modern features and appointments. Overlooking Eagle Beach listed as one of the top 10 beaches in the Caribbean by Travel Channel, the 10-acre La Cabana features spacious well-appointed units with scenic views of white sand and turquoise waters. The property is in the final stages of a multi-year, multi-million dollar renovation program, which includes the transformation of all 449 guest rooms, as well as the refurbishment of building exteriors, common areas, and amenities. Other recent enhancements are the addition of the 8,500 square-foot Glitz Casino and the full-service Citro Spa. Resort guests can enjoy a wide range of on-site amenities, including authentic Spanish tapas at Las Ramblas, casual dining at Islander Grill, boutiques in the Arcade, health club, sauna, swimming pools, racquetball, and squash. Numerous attractions and activities are available nearby, including the Bubali Bird Sanctuary, Butterfly Farm, California Lighthouse, Alto Vista Chapel, horseback riding, and a variety of water sports. La Cabana also earned the TripAdvisor® Certificate of Excellence for the fifth year in a row in 2015 for delivering excellent service, and as a result, was presented with the travel site’s newly created Certificate of Excellence Hall of Fame award. In 2014, the resort achieved the highest level of certification by EarthCheck, one of the world’s largest certifiers of sustainable travel and tourism operators, for its commitment to environmentally friendly practices.